-Atmospheric Black Metal with Ambient influences, this debut album is a promising jewel deep within the underground. -Back in stock! Compilation gathering the three demo's from 2004, 2005 and 2006, showing the roots of the bands' famous epic sound, highly recommended! -Back in stock! Epic and highly atmospheric pagan Black Metal recalling the early days of In The Woods... and Darkwoods My Betrothed. -Evil and old school rehearsal desecration, very good! -Bestial and old school Black/Death Metal from Poland influenced by Beherit and Sarcofago. -Cassette version of the debut LP by Sump related blackened Death Metal project. -Melancholic epic riffs with agonising vocals and great productions, recommended! -Vinyl version of the tape. -Old school rough and primitive black metal like Fimbulwinter, old Gorgoroth, Trelldom demo. -Incuding their entire discography, mandatory! -Underground true Black Metal from Peru. -Extraordinary Vampyric hatred from the deepest recesses of the Quebec catacombs, highly recommended! -Side project of a member of Lascoweic/Svetovid/Sunchariot/Surt, pure cosmic insanity. -This release is actually an industrialized noise version of Lascoweic/Svetovid/Sunchariot/Surt material. -Raw, cold and emotional Black Metal with folk touches, proud epic moments and deep atmosphere. -Dark Lovecraftian Black Metal from the bottomless pits of Polish underground. -All 3 bands wrote new material with the same concepts, based in the mentioned album title. -25 minutes of raw yet melodic black Metal sang in both latin and french. -Two new acts from Quebec rising form the underground gathered on a single cassette. -Features interviews with Black Cilice, Verglas, Torture Chain, Grinning Death's Head and more. -This issue focuses in depth on the current Australian Black Metal scene and features an extensive review section. -The album from 2004 released officially on Cd for the first time. -Back in stock! Underground Black Metal done like in the old days, very few in stock. -Ende performs a melodic and atmospheric extreme Black Metal. -First part of their split seris, obscure and minimalist accoustic music from both projects. -While the repetitive riffing and screeching vocals of "As The Wolves Gather" may remind of Burzum, plenty of originality is to be discovered behind the raw, echoing sound. -With its 3 lengthy, ingenious songs this EP stands almost as strong or equal to the follow-up album "The Curse Of Mankind". -Their finest full-length which sets free feelings of seclusion and sadness; with addition of harmonica, influences from The Velvet Undrground and poetlike lyrics. -A classic, enthralling album sporting the aura of 90's Black Metal while giving a nod to the folkloric music and culture of the French part of North America. -For its third album, Forteresse takes a more hypnotic and introspective approach and offers a majestic and melancholic opus that is sure to appeal to the fans of the group. -After exploring more atmospheric avenues, Forteresse returns to a more traditional and aggressive breed of Black Metal for its fourth album. -Two of Québec's best know patriotic acts, Brume d'Automne et Forteresse, come together with pride on this EP, each with a new track. -10th anniversary edition, remastered and with an exclusive cover of Burzum's Black Spell of Destruction! -Voidwandering black metal... Cold and tortured material, shaped in nocturnal and spiritual possessions at the plains of madness and insanity. -Featuring interviews in French and English with Akitsa, Deliquescence, Drowning The Light, Satanic Warmaster, Sorcier Des Glaces, Sortilegia, Tukaaria, Urfaust and more. -Five tracks of cryptic necromantic Black/Death Metal. -Extremely raw and shredding, freezing Black Metal yet with great melodies and riffs and even a symphonic ambience. -Grim Black Metal comming from Finland with destructive drumming, evil filthy guitars and bestial vocals from hell. -Raw yet symphonic occult Black Metal, an experience of the darker domain with a soulpiercing atmosphere. -Guitar based Black Metal, now out of the symphonic synth material of the past. -Clut recording by one of the greatest Death metal band to ever existed, mandatory! -Raw and cult Black Metal from Portugal. -Back in stock! Sacrificial and chaotic Swedish Black Metal featuring members of WOD and Funeral Frost, highly recommended! -Featuring interviews with Wulkanaz, Vordr, Agathus, Tenhi, Hexvessel and more. -New edition by Ancient Order Productions, highly recommended! -Back in stock! Melodic, fast, harsh and hateful Black Metal, their first two demo's now mastered and compiled on a single tape. -Furious and unholy Black Metal with great riffs from Quebec, this is their second demo. -Violent Black Metal from Poland released by Putrid Cult. -Pagan Metal featuring Shatraug of Horna. -For their first release under the Sepulchral banner, they now revisit their cult first recording, this time entirely re-recorded with 3 new songs and a new outro. -Monarque returns with an excellent exclusive track while Bardunor (Monarque, Csejthe, Hiverna, etc) presents his brand new project Crepuscule. -Dutch Black Metal from the 90's, original pressing on Creations Of Necromantical Mysteriis. -Greek occult Black Metal legends. -Six tracks of frostbitten Polish raw Black Metal cult, highly recommended! -One track each, dark unholy Black Metal. -This album deals with primeval fears of mankind that come in many faces. Not only contemplation about friends and nation, but also lying side by side with your foes on the battlefield. -Back in stock! Comes with two exclusive bonus tracks and completely new artwort! -Black in stock! Germanic Black Metal cult release finally available on a splendourous gatefold DLP, side D contains 4 previously unreleased bonus tracks. 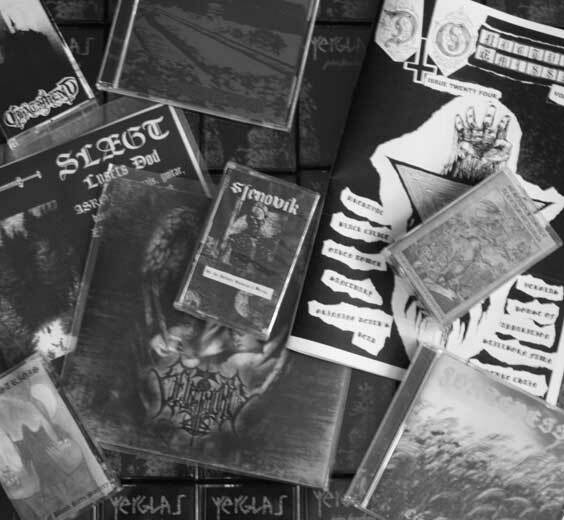 -Mostly instrumental atmospheric Black Metal from the Netherlands. -Strange but raw underground Norwegian Black Metal. -Extreme and radical right-wing Black Metal. -This should need no introductions... This is the 2012 edition on Night Birds Records. -Cold old school Black Metal. ...and the truth of ages shall reveal itself to you. -Grim and mysterious Black Metal, totally underrated... A must to know. -Silence, solitude, tristesse, desespoir... highly recommended! -Debut demo reissued on vinyl, the is the black vinyl version. -This album presents the most violent and bestial set of songs made by Satanize, an intense ritual of punishing Black Metal. -Seelengreif are back after 5 years with their first studio album which includes seven tracks of melancholic Black Metal, recommended! -If you need a description, you don't need it. -Atmospheric experimental Black Metal with acoustic elements. -Two long sides of raw northern Black Metal from Yorkshire and Copenhagen, highly recommended! -Classic Black Metal split from the French Canadian soil. -Back in stock! Representing the cold and white landscapes of the north through a 56 minutes tribute to early 90's Black Metal. -After thirteen years of non-existence, Norwegian Stormfront returns with three new tracks. Necrostigis is pure underground Black Metal from Poland. -The debut demo reissued by Hammerbund. -Epic Pagan Metal in the style of Morrigan, Falkenbach and Bathory. -Brotherhood of Light mystical unit. -New edition of this cult Black Metal demo on Ancient Order Productions. -Swedish melodic Black Metal from the 90's, original pressing on Creations Of Necromantical Mysteriis. -Raw desecrating blasphemous darkness released on Grievantee Productions. -Compilation featuring exclusively Brotherhood of Light bands such as Lascowiec, Surt, Cosmic Breat 88, Sunchariot, etc. -Their debut promo cassette reissued, over 65 minutes of madness! -White Medal material from a few years ago originally recorded for the failed split with Instinct and only just now seeing the light of day. -Impressive debut from this unholy Black Metal unit from Greece. -Back in stock! Seven devastating songs equipped with a raw production that carries on the sound of the early nineties, mark this grim attack of German Black Metal. -Grim, powerful and devastating German Black Metal, highly recommended! -Eccentric and inspired Swedish Black Metal, highly recommended! -Pride, strength and fire straight from Poland. -Patriotic Black Metal from Poland, their second album. Soon available from Tour de Garde. 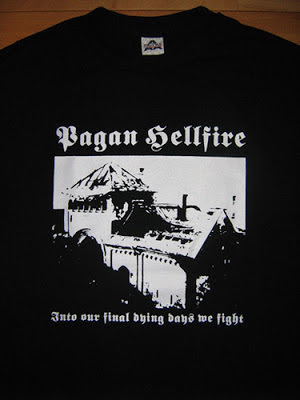 Pagan Hellfire "Into our final dying days we fight" T-shirt is now available. White printing on quality black shirts. Available in sizes S, M, L, XL for $15 CAD + shipping.